‘Enriching History Teaching and Learning: Challenges, Possibilities, Practice’ was published last week. It’s a collection of papers from a conference in Sweden on history teaching and learning in higher education that I attended last May. Attending the conference were historians not only from Sweden, but from the UK, Australia, Germany, Russia and Cyprus among others. What I found particularly fascinating was learning about teaching history in very different systems of higher education – in the case of Russia and Cyprus in the face of political divides and pressures that made teaching at the same time immensely challenging and intensely relevant to students’ lives. History really mattered. This reminded me of work I did with historians in Romania in the early-mid 1990s when history was on the frontline of contemporary political debate; seemed alive and full of significance. 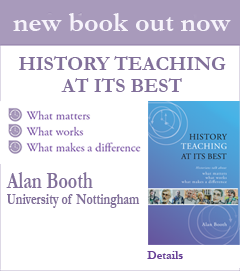 It made me think about how the whole meaning of teaching and studying history was different: imbued with a wholly different tone and resonance to my experience in UK higher education. And it made me reflect how difficult it is in the UK (yet how important), to get students to see the subject’s relevance to their own lives – to really feel it deeply and not regard it as simply something to read in books and articles; something abstracted from their lives that historians argue about seemingly without end. First, the concern everywhere about the relentless rise of standards agendas that seemed to hold the promise of enhancing teaching but all too often in practice introduce unhelpful levels of bureaucratic constraint and a compliance culture. There were fears expressed from many directions that control of the curriculum was being lost and that innovation was being smothered by a need to comply with regulations or the need to ‘measure’ learning outcomes. There was also much talk about growing government interference and a dulling bureaucracy around teaching that stifles rather than helps teachers to grow as educators: be truly creative. Second, classroom challenges were often similar. There was a lot of talk about the (lack of) preparedness of students for historical study when they arrive at university and the need to make that transition more effective. And there were common concerns around student motivation and a growing consumer mentality, and, more subject-specific, about the best ways to get students engaged with historiography and the role of new technologies in fostering historical thinking. Third, I was struck by how constantly busy colleagues are wherever they are located – all trying to be ‘excellent’ in all parts of their professional lives; attempting to satisfy often unclear or competing and conflicting agendas. How can they find the will to be as good as they want to be as educators? How can they find time to read, reflect – even talk about their teaching? If we want history teaching to be truly effective, we need more time and spaces (metaphorical and physical) for talking and thinking about teaching (as well as more recognition of course). Anyway, under conditions of relentless pressure there will be little serious reflection and too little innovation. So, ultimately what this conference made me think was that we need to think about ourselves as a worldwide community of educators more than ever before. More opportunities for conversations between historians in their role as teachers are not only needed but a pressing necessity: not just between colleagues in the same department but between colleagues nationally and internationally. Historians have a strong sense of kinship and a lot of valuable experience to share. Efforts are being made to do this through, for example, History SoTL, the international network of historians committed to enhancing teaching and learning in the subject; but all of us have a responsibility to contribute: after all teaching is at the core of what we say we value in our professional lives. Perhaps through connections and collaborations like those I saw in Sweden we might begin to take control of our teaching lives, because right now it feels like we are losing ground. And perhaps that’s why this conference felt so good – it provided a constructive opportunity not only to find out about different ways that teaching is delivered but the many things we have in common as teachers.